I want to design my garden. Where to start? | Live people - live design! I want to design my garden. Where to start? You can order a garden project from us at www.garden-interior-design.com! When starting to plan a garden, at first you have to estimate the values and disadvantages of your site. Analyze, where you have great views – to the neighbouring forest or lake, to a beautiful tree or to a hill inside your territory, mark them on a plan. Mark also important views like from the living room and from the terrace. At the same time analyze bad views e.g. to the neighbour’s household area and mark on a plan any views, that you would like to screen. Evaluate the existing trees in your garden and decide, which ones you would like to keep. Make a wish list, what elements you would like to have in your garden: a tree house for children, a vegetable garden, a barn, a gazebo, a fireplace, a dog’s kennel etc. After you have understood, what you want from your garden, you have to embrace all planning aspects in your garden design. Functional aspect is the most important in garden design. The garden has to be logically arranged and convenient in use for all the projected functions. The functional planning starts with the division of functional zones. A garden can have a representative zone, a recreational zone (for passive and active recreation, for example, sports), a household zone, a children’s playground zone and other zones. The representative zone usually is situated in front of the house and it includes the first view towards the garden. The representative zone has mainly a decorative function therefore it should be decorative in all seasons. Evergreen plants of sculptural forms are appropriate for the representative zone as well as plants with decorative leaves, a long flowering period, decorative grasses and other plants, which have a long decorativity period. The front yard can have special decorative elements like ornamental pavement, a fountain or a sculpture, a decorative pond or an art installation. A recreational zone is an area, where the family spends the leisure time outdoors. It usually contains a terrace or a gazebo with a dining table, a lawn area for different activities, it also can have a swimming pool or pond, a hill, some recreational equipment like a trampoline or a rocking chair etc. Depending on the size of the garden a sports field can be included in the active part of the recreational area – for basketball, for tennis, for volleyball and other sports. For the recreational zone such plants will be appropriate, which have a long flowering period during summer time, also scented plants can be welcome nearby the terrace. 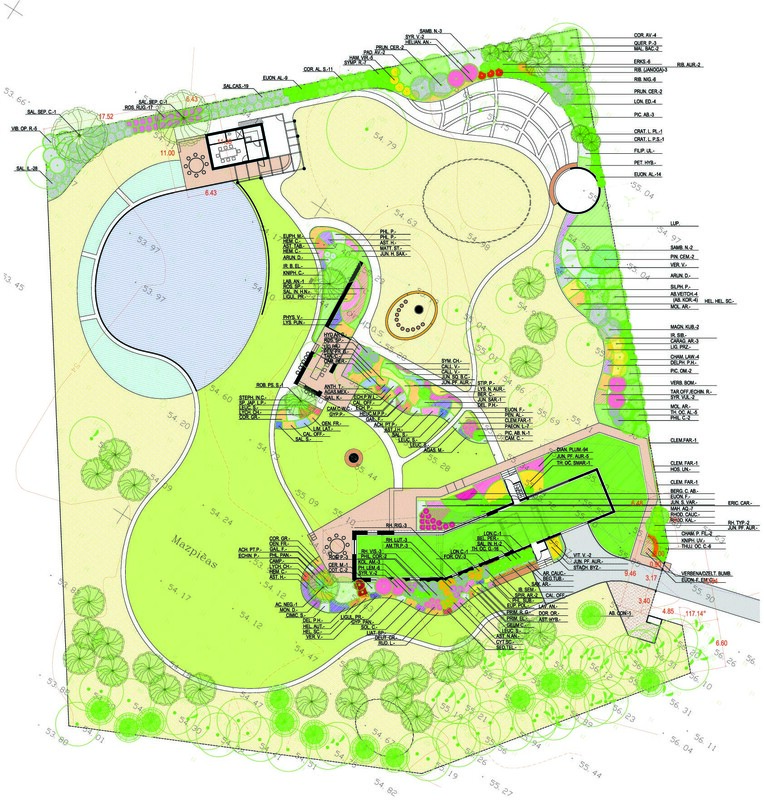 A family with children will find it important to design a children’s playground. It should be situated in a garden area, which can be conveniently supervised by adults – in direct view from the kitchen, living room or garden terrace – choose a view point, where you spend most time, when being at home. Plan the playground in a place, where the sun can approach it, but also shade is available in hot weather. There are different types of play equipment for children up to 6 years of age and from 7 to 14 years. If you have children in both age groups, arrange the play equipment in separate play areas. Choose the concept of the play equipment according to, what skills you want to develop most: equipment for sports, gymnastics, equipment for imagination games, for social development, adventure style equipment etc. In the children’s play area edible plants can be planned as well as richly flowering plants. Avoid plants with thorns and it is extremely important to avoid poisonous plants in the garden at all, if you have children. The household zone is an area, where a parking lot for cars can be situated, a barn, a greenhouse with a vegetable garden, a compost heap, a fenced area for the dog, a litter-bin, a storage place for construction materials etc. The household zone can be screened from the rest of the garden by a row of dense plantings or it can also be left open and arranged in a pleasant way. There are modern concepts for arranging a vegetable garden now, that finally it can be just as decorative as the main flowerbed in the garden. If you prefer to screen the household area, use evergreen shrubs, an evergreen clipped hedge or a trellis with evergreen climbers. When the analysis of functional zones is accomplished, arrange the functional elements in the garden accordingly to the functional zones. Do not mix in one zone elements from other zones, which do not belong there. Ecological aspect is about the naturalism of the site, about the ecological compatibility of plants as well as about the global ecological situation. The natural values of your garden are unique, they can not be recreated by a man’s hand therefore they should be preserved and enhanced in the garden design. If you have a natural forest stand with a forest ground cover, a wetland or a natural meadow, these are biotopes, which grow in the specific conditions of your territory – preserve them and place new elements in these places delicately by using natural materials and wild plants. Think twice before cutting an existing tree or eliminating a group of shrubs. It is important, that you examine the ecological conditions of your site before starting to plan new plantings. All plants have specific growing conditions and they should be planned according to the conditions of your site, where they can grow. There are sun loving plants, which will grow only in full sun conditions, shade tolerant plants, which can grow in sun or semi shade and shade loving plants, which will grow only in full shade. The demand for humidity also differs: some plants need humid soil conditions, some – dry or medium humid. The demand for nutrients differs: some plants will grow only in fertile black soil, but others are satisfied with sandy soil. There are some plants, which can grow in a salty soil – in territories near a sea or ocean. The pH of the soil should be checked in different parts of the garden. Most coniferous plants, heathers and rhododendrons love acid soil conditions, but there are others, which grow only in alkaline conditions. Be sure, that you choose plants, which are appropriate for your climate conditions, check the plant’s winter-hardiness before buying it. Experience shows, that some shops sell imported plants, which are not appropriate for the local climate conditions. Get acquainted with the expanding properties of the projected plants. In mixed flowerbeds do not plant aggressively expanding plants, which can take over the whole flowerbed and lawn. Do not mix plants with opposite needs together. If you will plant an alkaline soil loving plant, for example, next to a plant, which grows in acid soil conditions, one of the plants will always decay no matter how you improve the soil. Another common mistake is planting the plants too close to each other. When buying small plants in the nursery it is hard to imagine exactly, how will they look like, when they grow up. Find out the grown up size of each plant and place them by keeping a sufficient distance from the surrounding plants and other garden elements. A possibility for slowly growing plants is to plant them twice more dense and after they grow wider and reach each other to remove every second plant. Another important aspect to know is the flowering time of each plant. There are different approaches for arrangement of flowerbeds depending on the flowering time. One approach is to arrange the planting group so, that there are always some plants flowering and they change each other sequentially during the season. Another approach is to plan a whole planting group flowering in the spring, another one flowering in he summer and another one flowering in the autumn. This approach can be used, if the garden space is sufficiently big. To choose the right plant for each specific place in your garden, use our Garden Plant Catalogue, where a searching program will find plants, which match the selected conditions of every place in your garden. When designing your garden, think globally. Do not use materials, which can harm the environment. Think, how you will dispose your litter – plan separate litter-bins for each litter type. Use compost, natural fertilizers and solutions instead of chemicals, pesticides and herbicides. Decontaminate your waste water and reuse it for watering the garden, for example. Use garden lamps on solar batteries or even plan solar cells on your terrace roof. Plan garden elements, that you can use alternately with your neighbours, if it can save energy. Use energy saving heating systems. There are many ways, how you can think sustainably about the global ecosystem, when planning your garden. If we do it today, our children will benefit from it in the future. Visual aspect determines the way, how your garden will look like after establishment. There should be a united visual concept for the whole territory. Each garden is a composition of art like a painting or a sculpture or even a musical composition – it’s purpose is to express a sense of harmony. There are unlimited possibilities, how to choose the garden design concept. The starting-point of design is the existing situation – the surrounding landscape and the architecture style of the buildings. For natural landscape surroundings, a garden next to a source of water, a hilly territory or a building designed in modern, plastic forms, a dynamic design concept will be appropriate, made of naturally waving forms and disperse elements. 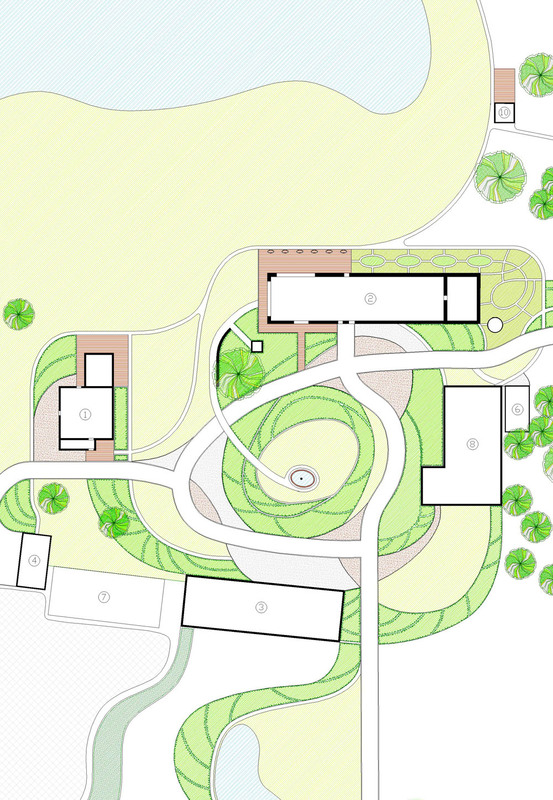 The newly planned garden should be perceived as a whole with the buildings, surroundings and existing garden elements. For a geometrical building, designed by a system of rectangles, a geometrical garden will be appropriate, designed in squares of pavement, lawn areas and plantings. It is suggested to implement forms or materials in the garden design, which reflect the architecture elements of the house. If the house and the surrounding landscape suggest different design concepts, the territory can be divided in different concept zones: an artificial zone by the house, a medium artificial zone in the middle and a natural zone in the outskirts, where the garden borders a natural territory. When choosing garden materials and plants, some visual moments should be taken into consideration. Warm colors always look closer, thus minimizing the perceived garden space, but cold colors on the contrary extend the perceived space. 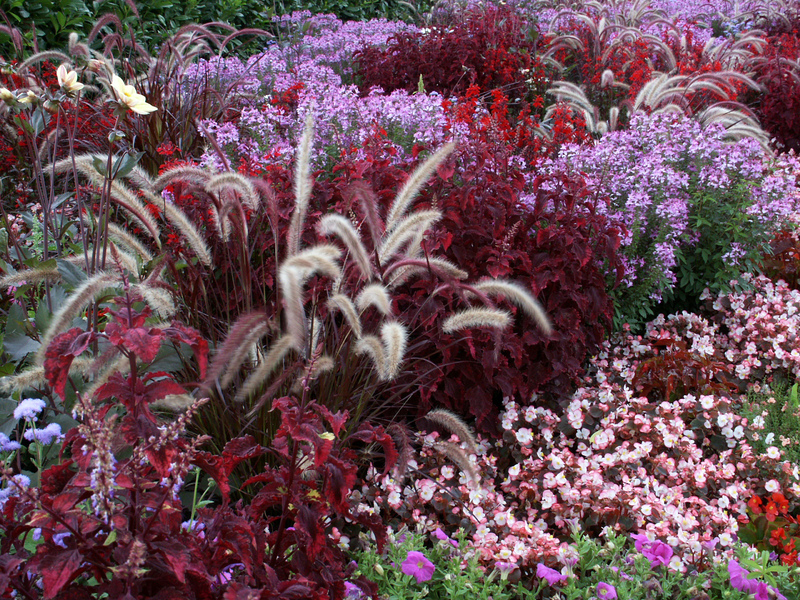 The flowerbeds can be arranged according to different color concepts – similar colors in one color gamma can be projected together by playing with different textures and plant forms, completely contrasting colors can be united to achieve an abundant, richly flowering impression on the background of a homogeneous lawn or hedge as well as similar colors can be arranged by having one outstanding color as a contrast element. When planning changes in the terrain, it is important to know, that all changes in level make the perceived and usable space smaller. Also to divide a small territory with plantings is not advisable – it is better to arrange the plantings around the territory by the border to screen the boundaries and make the garden look bigger. The most important aspect of space arrangement is scale – the plantings and other elements should be proportional to the size of the territory, the house and the existing garden elements. The size of plants should be chosen depending on from what distance the composition will be viewed. When choosing the right scale, the next step can be an interplay of rhythm and dynamics in the garden composition. A successful design can implement the rhythm of the house facade, the design of a decorative pergola or another garden element into the layout of the garden. Historical aspect is important in territories with a significant historical value. For example, an authentic baroque style building would require a corresponding baroque style garden with symmetry axis, clipped ornaments of hedges etc. It is also suggested to examine the history not only of the site itself, but also of the surroundings. What does the historically traditional garden look like in this area? Maybe there are some special features or materials used? If the house is built in a traditional style, then it would be appropriate to plan the garden also by keeping the traditions of the area. Symbolic aspect is relevant in territories with a special symbolic meaning – a memorial garden, for example, a garden, that is dedicated to somebody, a healing garden, a graveyard or a garden for a building of a special meaning. 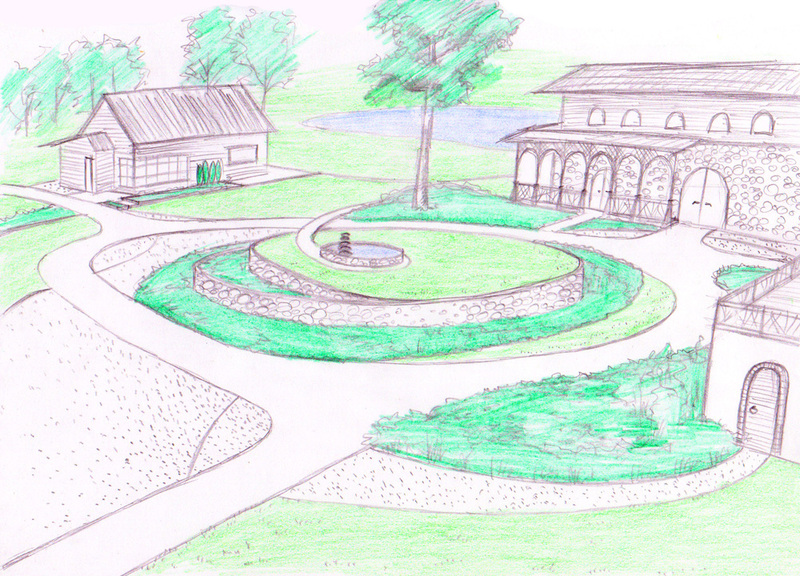 Also a very common private garden can be designed with a symbolic idea. The garden design can express emotions: joy or grief, pain or contemplation, anxiety or serenity. It can also express a tribute to some idea or a person. Each private garden expresses a tribute to the owner’s personality since it displays the taste and preferences of the owner. The symbolic effect can be achieved by the layout of the garden, which leads to some symbolic element, by a symbolic garden installation or even the whole movement through a garden can tell a story, that the designer has intended to demonstrate. Symbolic meaning can be displayed also in a direct way: symbolic signs can be engraved in some garden elements or displayed in the arrangement of pavement. Symbolic names can be given to garden paths, squares and buildings. Psychological aspect is relevant in each garden. The garden can have different psychological purposes but the most common purpose is to achieve psychological comfort by the garden design. Each person has a different optimal level of the surrounding impact therefore it is important to understand the personality of the person using the garden space to design an environment, which would be perfectly comfortable for the certain person. Important factors of the design are: the perceived harmony of the design, the perceived logical structure, complexity, mystery, uniqueness, multifunctionality, privacy, lightness, spaciousness, colorfulness, contrast and materials, that everybody consciously or subconsciously evaluates in the garden. Usually a harmonic, logical, lightsome garden is preferred with pleasant materials used. The amount of harmony, logics and light can be different for everybody to perceive the garden as harmonic, logical and lightsome. Other factors like complexity vary in preferences – some people like a more complex design but some think – the simpler the better. Mystery is a mysterious factor indeed, it is considered intriguing, if the whole garden doesn’t reveal at once to the sight, but too much mystery can also be perceived as threatening. Anyway an unexpected secret found in the garden can be very exciting. Uniqueness is usually a welcomed factor to design something unique, that others can admire. But there are also cases, when people want a common garden, kept in conservative traditions. Multifunctionality is especially useful in small garden spaces. A retaining wall can be also used as a bench, for example, as a table or as a support for some children’s play equipment or more originally as a blackboard for drawing with crayons. Multifunctionality also gives the user the psychologically necessary sense of control and choice. Every day the user can choose to use the multifunctional element in another way or to rearrange it somehow differently. Privacy is an intimate need, which depends on the person’s character as well as on the mentality. There are nations, which prefer to screen the whole garden and especially the recreational area from all outside views. Other nations on the contrary perform a more social lifestyle – willingly place a bench with a view towards the street, organize family events in the frontyard and invite all neighbours to participate. The perceived privacy is also directly connected to the sense of security, which is an extremely important factor for a person’s psychological comfort. To provide a higher sense of security different security elements can be planned starting from a fence and dog’s kennel and ending with surveillance cameras. Sense of security is also obtained by planning dense plantings, a wall or other garden elements behind all rest places to provide psychological protection from behind. Spaciousness concerns the whole scale of the garden. For small gardens there are design tricks to make them look more spacious. Big gardens on the other hand, if they are too spacious, they can become comfortless. In a big garden it is suggested to plan secluded rest areas to have a cosy rest, but also to maintain long views to have the impression of spaciousness. Colorfulness just like contrast should match the owner’s personal taste. If the garden is too colorful and contrasting, it can become obtrusive and disturbing, but if it lacks color and contrast, it can become too boring. The responsible task of the designer is to plan the different perceived factors in balance to create a harmonic environment. Economical aspect – during the planning process it is important to estimate, what expenses are planned for the projected garden. Depending on the budget size more expensive or cheap garden materials can be planned. The plants can also be bought cheaper in small size or more expensive bigger or even grown up plants. It is possible to plant even grown up trees, if big scale machinery is applied. When planning the garden, you should choose, how expensive elements you want in the garden – a heated pool or a bigger pond, a fountain or a sculpture, big paved areas and an irrigation system can make the garden establishment considerably more expensive. « How to design a stylish and functional interior? You are currently reading I want to design my garden. Where to start? at Live people - live design!.